US has invested massive amounts in man , machine and material to come up with an effective ASW system on global scale , here is a good write up on DARPA effort which played a key role in this ASW effort. Hopefully the Russian could catch up in ASW within the next decade. AFAIK the Nimrods are already cut... this article might be part of a move to get them back. Just look at all the money the west spent on deep submergence vessels. I don't mean deep submergence rescue vessels even though that is what the west called them because deep submergence and rescue are contradictions. It is either rescue, or it is deep submergence body recovery. In actual practise it was spy vessel and listening device planting system. The west was always more dishonest than the Soviets were in this aspect of the conflict, but a lot of ASW is about processing power and with Putin encouraging the production of super computers in Russia this should start to tip. I was reading about the US tests in Hawaii using Blue/Green Lasers to scan the ocean bottom for topography. Since Blue/Green Lasers can travel through water very well does anyone ever think UAV Subs will be built and controlled from satellites in space using blue/green lasers for transmitting orders? If nations could build submarines that could operate without people they could be made much cheaper. How will Russia hide it's submarines from a US Satellite or the P-8 Poseidon scanning the oceans with a blue/green laser? Are submarines going to be a thing of the past?....unless they are made UAV to run at deeper depths to avoid new US ocean lasers. I think submarine warfare is going to change drastically over the next 5 years. They have been talking about blue green lasers since the 1980s and yet the US Navy is still using active sonar to find conventional subs. To be perfectly honest a modern Russian sub doesn't need to operate within 10,000km of the US so all their planes can have blue green lasers. Last I read about them is that they are only effective to 50-100m in clear water so they are a bit like MAD or Magnetic Anomaly Detection gear in that they are no good for searching large areas... they are more use finding the precise location of a target spotted by other means. In other words they are a microscope... not binoculars or a telescope. Austin wrote: US has invested massive amounts in man , machine and material to come up with an effective ASW system on global scale , here is a good write up on DARPA effort which played a key role in this ASW effort. Austin i must say very thanks to you for this article (another bright proof ,if that was still necessary, of the lousy level of those type of PR publications aimed at public opinion consuption ) on the....supposedly.....great achievements of LAMBDA project in ASW operations and with a statement of ....Secretary of the Navy John Lehman ... even totally warped in its original meaning ,i have no laughed for so long since a very long time. Those J .Lehman's words, (a sort of public slogan which refer to capability to possibly engage the outer layer of Soviet submarines at defence of national SSBN "sanctuaries" in the first 5 minutes of a war thanks to the reduced range resulting from its "bright ideas" on NATO naval unit’s deployments ) are inserted,in fact, in the NATO naval doctrine it had proposed to contrast URSS's worrying quantitative/qualitative expansionand envisioning a "full offensive" deployment of an enormous number of US naval unities close to Northern URSS Navy controlled area -practically well within SOSS and Northern district Air Force's reach !! !- , relying on the rear coverage of SOSUS ,to "compress" operational manoeuvring's area of URSS's submarines and ships and ,supposedly, prevent so Soviet unities to press against or destroy the, at this point, vital SOSUS's nodes , becoming capable so to attack freely NATO's deep refurbishment lines. I know,i know this could appear a doctrine naive and totally suicide ,but it appear so for no other reason that it…… WAS totally suicide .... , but we must realize that it is the same John Lehman who, in the meantime that all the NATO’s scientists of the sector and all its strategic analysts was losing theirs sleep at compute how much days a large scale conventional offensive of URSS would have reach the European Atlantic coast and what type of tactical nuclear weapon’s employment (the only serious and credible response found to have some chance of success) would have not triggered a nuclear response by part of Soviets and when the whole NATO diplomatic sectors was attempting to lure Soviets at sign the CFE , had proposed as solution to...invade "at surprise" URSS from the Pacific and reach Moscow after a ground campaign through the Siberia !!! "Pray the God to preserve Secretary Lehman in spirit ,in health and.....in charge"
3) That Soviets had ,since a long time, realised that increase in quieting would have rendered passive acoustic detection a less and less central element in ASW and invested heavily in breakthroughs in not acoustic detection , in particular with space-based submarine detection (URSS was already at the time at least 15 years head of NATO in the anti-surface worldwide detection and tracking system with RORSAT / EORSAT ), capitalising obviously the very poor depth limit of large majority of NATO submarines, and convection cell detection ; all of that linked to the capability to conduct a true decapitating strike against NATO ballistic submarines employing thermonuclear RVs of land based ballistic missiles (the successful tests conducted in 1984 with RSD-10’s RV in the Barent Sea confirmed the capability) . In the next decade ,under total silence , Russian Kosmonit Center would have likely already completed and put in orbit the second generation of submerged submarines multimode detection/tracking satellites (capable also against enemy submarines travelling at greater deepness ) ; catching with USA’s ASW capability's line -a true technological blind-alley as already brightly foreseen in URSS times -, would mean literally for Russia an involution of 25 -30 years. Austin wrote: Hello TR1 and others who can read Russian. Is there any thing known on Akula SSN noise level and acoustics ,how did she perform in service ? I have been trying to do some research on it and it seems even US Admirals have been impressed with Akula performance. I am looking more in terms of what reputed Russian write up has to say on it ? Since I have read what most Western authors had to say on it. What is the status of Victor 3 SSN specially the most modern ones ? As you can see since Improved Akula's operational introduction SOSUS becomed almost completly useless and at tactical speed - up to 9 Knots- improved Akula gived proof to be almost undetectable even when very near to densely defended USA Eastern sector. This can aid you to realise the very unwise and nearsighted choice ,by part of USA, to put all its eggs in the acoustic department when Soviets ,conversely, with a more holistic approach, had gained primacy in almost any other segment of subamrine technology, each of which capable to offset or also surpass any possible advantage in the acoustic department and in ways much more difficult to neutralise. Russian Navy consider ,at today, to have not only reached but surpassed the USA submarines (as already foreseen by N.Polmar more than 15 yeas ago) also in this last technological niche -quieting- with Yasen and that this primacy will be widened with Kazan (at least until a new generation of American submarines will see the light). Mindstorm , Its good to hear from you on this issue. But with due respect would have to defer on your conclusion that USSR submarine were superior to NATO/US on acoustic quietening. 1 ) US and to a good extent NATO held a complete acoustic superiority over USSR submarine specially in the long range detection of submarine in narrow tonal. For good part of USSR post WW2 submarine history Soviets were not even aware of this weakness till it was given away by Walker espoinage ring. 2 ) Soviet Submarine scored in areas like having superior numbers and perhaps superior weapons but inferior Sonar system and Electronics. 3 ) Soviet submarine caught with US early LA class of submarine with late model Victor 3 , Akula SSN caught up with LA class and Akula 2 were superior to improved LA class , but by then US moved to Sea Wolf Class and then Virginia Class SSN and retained their superiority once again. 4 ) Only with Yasen SSN Russian Acoustic will catch up with US Virginia and NATO 4th Gen submarine like UK Astute ....Yasen is superior in fire power ofcourse but US today has a large fleet of Virginia SSN and 3 Sea Wolf class so number advantage is still heavily tilted with US Submarine fleet. 5 ) Akula-2/1 SSN are really no match for Virginia or Sea Wolf in acoustic quitening or Sonars , it does have some kind of non-acoustic means of detection system called SOKS but no one really knows how well it works , I have yet to hear on any Akula sucessfuly tracking a Seawolf SSN or Virginia SSN , if you have heard of any let me know. 6 ) Akula SSN though have tracked US LA Class and US SSBN quite a few times. As per Russian Admiral UK SSN is a much bigger challenge. 7 ) We really do not know how well Space Based Submarine Tracking sensors well actually , I have my doubts on it. Ofcourse statements from Official like we will take out all Soviet submarine in first 5 minutes of war is foolish at best and mischievous at best. But there is also no denying that US retains a good deal of acoustic advantage over current Russian submarine. Most respected western authors like Normon Polmar also believe that US retains the advantage , Books like Rising Tide by Russian author also confirms US acoustic advantage and why to find exactly how much they lag was the reason Russian Admiral carried Op Atrina with Victor SSN. Mindstorm wrote: As you can see since Improved Akula's operational introduction SOSUS becomed almost completly useless and at tactical speed - up to 9 Knots- improved Akula gived proof to be almost undetectable even when very near to densely defended USA Eastern sector. Agreed Akula could over come the SOSUS net in peace time and is also agreed by Western authors like Norman Polmar. As far as being undetectable in Eastern Sector thats debatable recently two Akula was detected in US eastern waters and was tracked till she went to canada and then it dissapeared , one was reportedly the Gepard. Oscars 2 have been sucessfuly tracked by US. Like i said Russia reached Improved LA class acoustic quitening may be even have bettered it at slow speed , but US went much ahead with Sea Wolf and Virginia and retains acoustic quitening advantage. Agreed in some respect Soviets/Russian have explored with many designs , played with metals like titanium and have more deep going submarine and fast going one and also has good deal of work in acoustic quitening. But US submarine have retained quietening advantage and they have advantage as far as sonar performance goes due to their advantage in Digital Signal processing and electronics. Yes I have Norman book "Cold War Submarines: The Design and Construction of U.S. and Soviet Submarines, 1945-2001" and it has good details on US and Russian submarine development. Actually the prediction of Norman Polmar is based on fact that Soviet would have 4th gen Submarine Yasen by early 90's but due to break up of Soviet SSN development lagged for 2 decades and hence US continued to retain advantage. Norman Polmar says with 4th Gen submarine Yasen Russian will match up with US acoustic level that came with Sea Wolf and Virginia. So Yasen will not widen any acoustic advantage but will just match up to US. Here is US Navy Office of Naval Intelligence ( ONI ) estimate on Submarine Noise Level , this is the only official report that we would ever here on the other wise very classified subject. "Why do you assume that we would make no progress in this field in the decade between theirs design ? " Already at the time an US Intelligence analysts admited that from data in its possession in some acoustics regimes Severodvinsk would have been at least as quiet as the American Sea Wolf ,but not "across the whole board", naturally since 1993 the design has been modified and optimized to host the up-to-date technical solutions which became disposable in the over 13 years elapsed ; to the contrary USA design not only remained just that of those years (with submarine design frozen by thye idea that URSS collapse would have effectively blocked the development of a Russian 4th generation submarine for at least 25-30 years ) but them was forced to opt for the simplified Virginia over the superior Sea Wolf for the problems linked to prohibitive costs and manifacture. But that is not what i have said . What i have said is that USA puted all its egg in the acoustic departement of submarine technolgy with the result that,progressively,it becomed the unique sector of western primacy against Soviet designs (if you want i can explain what are the enormous operational advantages produced by all the other parameters and features of a submarine , elements not surprisingly keep under total silence in majority of western publications of the sector). At half of '80 years even this last "bastion" of western technical primacy -quieting- was shattered and only the vertical diving number of constructed submarines in Russian shipyards prevented the scenario foreseen by John J. Engelhardt on Soviet submarines bound to surpass US ones under a qualitative and quantitative standpoint. Mindstorm wrote: "Why do you assume that we would make no progress in this field in the decade between theirs design ? " Yes I know Malachite said that to Norman Polmar when he visited Russia its there in the book I mentioned above. But i am not stating that progress was not made , it was made in the sense that Akula-2 surpassed Improved LA at slow speed or tactical speed but see US has not remained static it has moved to Sea Wolf and then to Virginia .......that was my point ...the russian lagged behind the US even with Akula. Considering the number of Improved LA , SeaWolf and Virginia operational and consider the number of Akula-1/2 operational and you get your answer. Well US intelligence is not homogenous and each dept have their own views ....there is no doubt that Yasen will be as quiter as Sea Wolf and we will have too see when she starts her patrol and US Intel gathers more data on acoustic quitening of Yasen and what they think before that its all theoretical. Virginia is as quite as Sea Wolf but not more , Virginia is built for Litorral Operation compared to US Sea Wolf designed to hunt USSR SSBN in the Arctic ....Sea Wolf carried more number of weapons about 50 torpedoes , but Virginia is not inferior to Sea Wolf Acoustically. Sea Wolf was cancelled because the Deep Water threats of Soviet Dissapeared after 1992 and USN was more concerned with Litorral operation and threat from Silent Conventional Submarine and Special ops , intelligence gathering etc. Yes I agree US put too much emphasis on Acoustic , that is because the chief architect of USN Submarine Program Adm Rickover believed Acoustic was every thing and their designer strived to achieve just that. USSR capability was more broad based because they had competing design bureau and they had many design and ideas to play with , but when it comes to acoustic and quitening US retained a good advantage atleast it mid 80. Yes it was broken with Victor 3 and Akula where narrow band tonals was drastically reduced and noise level were comparable to LA class but US retained it advantage back with Sea Wolf and Virginia. I suspect Severodvinsk will do more than just catch up to Virginia . American insistence that it took the latest 971s to catch up with the LA also always struck as me as wishful thinking at best. What about Sierra class noise level? Sierra was the high cost submarine vs the Akula, which was made of cheaper materials. Sierra is made of Ti. I would add that the chart above is estimates and assessments by the US Navy, as as we have seen in Iraq and Iran the US Intel often has an agenda. I rather expect they want to prove it has all been money well spent. At this point someone could ask to itself ,only for formulate some easy samples : how much submarines are required to engage an enemy submarine enjoying a substantial speed advantage over them ; or how much times is increased the search area for ASW units (both sea or air based) sent in the area to investigate a possible sonobuoy contact with a similar fast submarine ,how that diminish of several dozen of times the chance of a successful interception and multiply of an equal measure the resources and the assets necessary for the task ; or how much decrease the engagement footprint of enemy torpedos against a similar submarine following an evasion rout (and what type of weapons become totally incapable to engage a similar submarine at particular deepness ); or how is easier for similar faster submarine to achieve local superior concentration in respect to slower opponents ; or how is easy for a similar submarine to reach a particular strategic point of interest ,carry out its mission, and eveade even before opponent's submarines/ASW units can arrive in the place. I could go on for days and have taken into examination only the speed parameter. We can,now, take into examination a submarine attempting to shadow or chasing to engage an enemy submarine and try to argue what wouldhappen if the latter is capable to release ,almost at will, a vehicle ,programmable on the fly (such as an MG-74),capable to mimic exactly the acoustic track of the submarine's propulsion at its regime at the instant of the release while contextually moving at very low speed long a tangential trajectory to obtain an easy shoot on any submarine eventually chasing it ,or it could ,to the contrary, continue long its original rout increasing momentarily the speed at maximum to cover completely the release contemporaneously of an MG-74 simulating a false slowdown and an U-turn and a PMK-1 self propelled mine , or ,even worse release, a pair of MG-74 with different programs covering the release of both an PMK-1 self propelled mine and a self propelled RG-28 capable to simulate perfectly a coded pulse of the active sonar of the carrying submarine...also here the possible combinations ,one more deadly and deceiving of the previous are almost infinites. Anyone can easily realize also as,in war times,the surving chances of a chasing/engaging submarine against an enemy submarine equiped with similar systems (without any corresponding in the acoustic centric western designs) would be very very slim . What happen if we take into account that a submarine ,even in a condition of heavy numerical disadvantage in a particualr area could quietly employg its active sonar (against which the quieting measures implemented in a submarine design have zero value) knowing that a single allied submarine ,completely safe at 100-120 km from the enemy ,receiving the target coordinates through MGK-80 or Molniya-M, could engage all of them at supersonic speed with a salvo of RPK-7 and obtain theirs destruction much before the first torpedo would even be at half way toward the original submarine....or it could be simply another trap employing the MG-74 and the RG-28 (practically those enemy submarines would never know,after this active sonar contact if a salvo of "Stallions" is already in fly toward them ,it is a trap for lure them in a PMK-1 infested area or in a shot position where the enemy could dispatch them quickly with supercavitating torpedos or even a bait to waste precious ASW aircraft and ship for the control a completely empty area. All what said until now represent only a minimal fraction of the enormous operational advantages and solutions offered by merely two of those non-acoustic capabilities where Soviets/Russians enjoy a very wide primacy . TR1 wrote: I suspect Severodvinsk will do more than just catch up to Virginia . Yasen is certainly superior in firepower,perhaps even depth and non-acoustic sensor where russians have a lead ....... it will according to most credible western sources catch up with Virginia in acoustic .....again let me add here most of these are estimates and actual performance will be seen when she goes on her patrol and we will hear more on it from ONI or Western press. Not really 971 but late model Victor 3 SSN which also was the first to employ the initial SOKS ....Victor 3 drastically eliminated narrow band tonals which made long range detection and tracking of Russian sub impossible by NATO.....Akula eliminated those even further and had better Sonar,Sensors and Hydrodynamics and yes SOKS. But LA class are initial LA and then improved LA , the late model Akula-2 caught up or even superseded improved LA in acoustic quitening at slower speed. If you read the book "Rising Tide: The Untold Story of the Russian Submarines That Fought the Cold War" which details Russian account of Silent War and not Western Account that we are so used to. There was an incident where the late model Victor-3 detecting and tracking a new LA class submarine using just non-acoustic sensor and at the end of trail she active pings the LA and moves on. TR1 and Mindstorm ,have you come across news in Russian press of any Russian modern SSN sucessfully tracking a Virginia or Sea Wolf class SSN , I have yet to come across such reports till date. Mindstorm what what you mention are true to a great extent but please remember American and by that extent Western submarine put too much money time and effort on Acoustic Quitening becuase they came from School of thought "Noise is Every Thing"
So lead by Adm Rickover who is considered as father of Nuclear Submarine program they focussed on one single parameter which is how to reduce noise and sacrificed Speed , Depth , Hydrodynamic , Materials and other areas of development. And that has been the case with all submarine SSN development till late model LA. Till they found out Soviets were ahead in other areas and Soviet were catching up in quitening and then the 2nd phase of SSN development started. 2nd Stage SSN development started with Sea Wolf class with no rickover ghost hanging concentrated on much improved acoustics , sensors/sonars improvement , depth , speed and much greater weapon payload. Sea Wolf class submarine and by its extension Virginia class has higher silent tactical speed , reportedly some where between 20 - 25 knots she remains silent enough to search a wide area without compromising speed ( it was refereed as higher tactical search speed ) , earlier the Improved LA could do that slower speed at ~ 6 - 8 knots and with less performing sensor. Sea Wolf also carried 50 Torpedo which means it did not need reload for long and could effectively hunt under the arctic Russian SSBN on partol or atleast that was the idea. So Higher Silent Speed , Greater Depth , Greater Speed ( Sea wolf did more then 45 knots in a trial close to 50 knots infact ) and much better sonar and sensor performance were the hall mark of 4th Gen SSN development , yes they also used pumpjet propulsion over 7 blade skewed propeller. Yasen infact still retains Skewed Prop and has not moved to pumpjet while Borei has pumpjet. Virginia has lower performance in Weapons Payload and lower Top Speed , but has similar silent tactical speed as sea wolf , plus the Sonars/Sensors and 3 Towed Array Sonar and even Wide Aperture Sonar on side. Yasen is the first to have Spherical Sonar , Hopefully they have caught up with sonar performance with the West though i doubt , hopefully acoustic quitening equal if not better then US 4th Gen SSN. Yasen lacks the Side Looking Wide Aperture Sonar but it has Flank Array like Akula. Firepower wise Yasen is superior to Virginia and Sea Wolf and hopefully Russian have improved on Depth which for Akula was still very respectable 600 m and top speed. I would personally be happy if Yasen catches with acoustic quitening of most modern USN 4th Gen Submarine and Sonar/Sensors performance similar to US submarine. Hopefully its much improved non-acoustic quitening which Russians lead gives its an advantage over US submarine in silent search and tracking. Hopefully the modern Torpedoes like Fizik-2 and Onisk/Calbir is good enough to take care of USN CBG. Again its a very tall ask but hopefully Malachite will be able to match up with its western peers. I highly doubt (it is more a certainty) that them will be a reliable source on the subject in question . Austin in the same book of N. Polmar ,which i have read some years too, one of the most intellectually honest western analyst and author in the sector, is reported what was the real opinions of western analysts and US Navy officials on the true capabilities of the fourth generation of Russian submarines,(also in those same hours in full production ,in versions significantly more advanced and including ,obviously, technical solutions much more advanced than those available in middle of '90 years). "It should be noted that in CANDID and PRIVATE discussions with Western intelligence officials, submarine commanders and technical analysts as well as with Soviet submarine designers, there has been a strong indication that Soviet fourth generation undersea craft would have achieved performance equal or superior to most aspect of theirs US counterparts "
Like you can see exist a very substantial difference between what those same persons can say on the real capabilities of theirs potential enemies in open speech or publications and what, instead, them are ready to concede in candid ,private discussion on the same subject (and that is almost a "law" in the West where ,to the exact contrary of Russian tradition, overselling its own military or technological capabilities while at the same time bashing those of its main competitors is almost a duty esteemed central in the information war. "The primary emphasis in design what came to be called SS-N-21 was quieting the longtime quest of the US submarine community.......While the SS-N21 was in the preliminary design stage, the Deputy CNO for Submarine Warfare, Vice Admiral Nils R. (Ron) Thunmann convened a group of submarine officiers and engineers to help determine the characteristics of the SS-N21. Known as Group Tango (the phonetic word for the T in Thunmann) ,this all-Navy classified study group adressed seven characteristics : 1) Speed, 2) Depth, 3)Torpedo Tubes, 4)Weapons Load, 5) Artic capability, 6)Radiated Noise 7) Sonar Effectiveness . Group tango established "goals" for the SS-N21 which were believed to be realistic and attainable. According to Navy sources the SS-N21 would meet only three of the seven goals : Artic capability ,radiated noise and sonar effectiveness "
Like you can see also the Us Navy's submarine with the best not acoustic related capabilities (anyhow a golden plated exception ,impossble to mass produce) fallen shorts of almost its requirements except those related to acoustics . But, if you allow ,i want to return to the question of all the other critical parameters and systems of a submarine . Take into examination one of them ,weapon systems at example ; here we don't talk of a metric difference (as for debates about the level of radiated noise of an improved Akula class and an improved Los Angeles class or against an Akula II or between a Graney and a Virginia ) here we talk of entire categories of weapons (and with them whole tactical and strategic possibilities) completely lacking in western arsenals . Image that: An Improved Los Angeles class, in the Pacific Ocean, receive a possible Victor III contact at 17 km of distance North -North West beam aspect descending rout ,another Los Angeles class follow this Improved Los Angeles at 38 Km behind while a Sea Wolf is in a position about 83 km to the East . Questin : What them can do ? Response :Almost nothing ,except for the original Improved Los Angeles to take the enormous risk to follow the original contact track before lose it (because in not peace times the chances to incur in a PMK-1 self propelled mine delivered by the Victor III -another weapon without corresponding in western arsenals) or a possible shooting trap with an "Impostor" or an engagement quickly degrading in a active sonar range engagement where you would have almost zero chance of surviving against the enemy supercavitating Shkval-M would be very high. At inverted sides : a Victor or an Akula could employ its active sonar (or even an RG-28) and pass the data to any of the other Akula or Victors (placed in the same positions of the other Los Angeles class and Sea Wolf of the previous example) and evade in all safety from area leaving the salvo of SS-N-15 /16 shoot from large stand-off ranges by those allied submarines destroy the enemy submarine(s). As easily understandable ,those type of weapons ,for theirs ranges and or very high speed and or impossibility to defend against, bring true game changing capabilities against highly time-sensitive targets such as nuclear submarines . Mindstorm , I hope you understand that though Norman Polmar is a very respected Western expert on matters of under sea warfare he also has an audience to which he address and that audience is US Intelligence Community , US Congress and US Navy. He regularly comes before congress when there is a classified/Closed and non-classified/open discussion on USN submarine capabilities and challenges. I know this since i have read few of the Congress Committee reports where his views were documented. He sometimes has the tendency to exaggerate Soviet/Russian submarine capabilities to suite his audience and make sure that Congress gives the necessary funds that USN needs or asks for by exaggerating Soviet/Russian submarine threats. So its good to look at Norman Polmar views and write up as respectable Western views do not take his views as absolute Gospel truth. And he has claimed on Akula in the same book that with Akula-2 SSN at Slow Speed it was quiter then improved LA class but over all improved LA class has superior to most Akula class. And what he says about Yasen class is based on his conversation and what he thinks could be the case but the proof of pudding is in its eating , so Yasen being equal to ,superior or inferior to Sea Wolf or Virginia is yet to be seen , as Yasen is still in trials. So lets not get worked up too much by claims and counter claims ....in couple of years we will know in general terms where does Yasen stands to US 4th Gen submarine in acoustics quitening. But from the many congress hearings i have read , USN expects Russian 4th Gen submarine catching up with USN 4th gen sub in acoustics , it might be equal or near equal to Virginia/Sea Wolf is what they expect. I would say if Malachite manages to achieve that then its very impressive and respectable , getting to US Acoustic level would be a very impressive achievement for Russian Navy which has always been on the loosing side of acoustic silencing game since the first Nuclear submarine Nautilus sailed the ocean and US managed to achieve those feat after spending many hundred billion dollar in over many decades. One should also not ignore UK SSN like Astute and French SSN Baracuda which along with Virginia and Sea Wolf works together in co-ordination and share data on Russian Submarine and is a potential enemy for Russian Navy. As far as your claim of weapons goes , it all depends if Russian Sonar has the ability to detect LA at those ranges where it can use the SS-N-16 like weapon .......if Russian Submarine tries to go active then it has it own down fall like being hunted by NATO/US Surface Fleet or by ASW Helicopter which might be in the area , Active Sonar does not gurantee that you will see the enemy submarine at long ranges as there are many factor than can affect sonar performance like water condition , converging zone , temperature,depth , salinity and others. But what active sonar will gurantee is you will disclose your position to the many enemy asset in the area and the hunter could get hunted .....one of the rare reason that submarine in very rarest situation uses active sonar. But it hasn't absolutely any need to do a similar thing in first person ,if we consider that it has, supposedly, as its great friend, no less than the....Chief Executive Officer of the Russian Northern Submarine Fleet Force, Capt of First rank Alexei Poteshkin, who fight with all its strength to aid the poor N. Polmar at gain some funds from the US Congress . "State trials of the submarine will be held this year. Hopefully, upon their results Severodvinsk will be recognized the most advanced and silent submarine in the world"
Austin maybe mine examples has been not enough clear ...i try to formulate one in a way more clear. - Atlantic Ocean. An Improved Akula transit near a group of sonobuoys ,a net of MAD sensors or a sea-floor thermo-differential detectors ,a momentary contact is established ; an Improved Los Angeles class is at 38 Km of distance and a Sea Wolf at 85 km from the contact point ; this Improved Akula is completely safe , some minutes and the contact is lost .... a very common occurrence in reality. - Atlantic Ocean. A Sea Wolf transit near a group of sonobuoys, a net of MAD sensors or a sea-floor thermo-differential detectors ,a momentary contact is established ; a Victor III class is present a 38 Km of distance and an Improved Akula at 85 km from the contact point ; this Sea Wolf is dead and without any chance to respond in any way to the attack , some minutes and a new wreckage is added to ocean floor. Weapons like RPK-2 ,RPK-6 , RPK-7 or Klub, in substance, allow to widely spread allied submarines to cover each the others, engaging enemy submarines in close ranges with one of the submarines of the group from a remote position and at supersonic speed (therefore don't allowing them any chance to evade) , the allied submarine in the area of the enemy unities, moreover, enjoy the crushing advantage to don't have any need to conduct the engagement in first person ,it can quietly evade from the area (possibly employing some MG-74s and releasing some PMK-1s in the area as a departure gift) ; the allied submarine in question can also employ safely its active sonar (or also an RG-28 to give to enemy submarines a position for the supposed active sonar's pulse totally deceiving), in fact if the enemy submarine(s) is discovered at close range it enjoy the enormous advantage conceded by its supercavitating torpedos , allowing the reliable destruction of enemy unities and the destruction of the wire guidance of theirs torpedo even before theirs torpedo would cover 1/4 of the distance ,if the enemy is at longer range it pass theirs position to the allied unities (both surface ships or submarines) evading from the area at full speed gaining deepness. Western submarines lack completely similar systems and with them any of the up-cited capabilities. Is clear now Austin ? What i find totally absurd is that those type of elements, capable to generate enormous differences in the exchange ratio between submarines equipped with similar offensive and defensive systems and others completely devoid of them ,are attentively "forgotten" in almost any western publication.....and it is not a chance. it says more info proving that Mindstorm is on the right track.. I hope you understand the way funding works for USN program where Congress has the power to fund it or veto it ....a credible enemy is required for USN to justify its funding. So Congress takes a broad view from USN , Experts in the field , Independent Consultant to arrive at a conclusion or provide a direction where development needs to happen and funding needed. Norman Polmar is one of the key personalities consulted and i have read quite a few reports where either USN capabilities are exaggarated or in other cases Russian Submarine capabilities. Here are some of the Congress Report that you will enjoy reading. Fair Enough .....the trial has yet to be completed and when she hits the water we will come to know in few years if she achieved her goals as most silent submarine. Dont confuse Statement of Intent as Statement of Fact. Atlantic Ocean. A Sea Wolf transit near a group of sonobuoys, a net of MAD sensors or a sea-floor thermo-differential detectors ,a momentary contact is established ; a Victor III class is present a 38 Km of distance and an Improved Akula at 85 km from the contact point ; this Sea Wolf is dead and without any chance to respond in any way to the attack , some minutes and a new wreckage is added to ocean floor. Mindstorm you do realise the submarine is a moving target that can actually move in 3 Dimension in Ocean ......lets say the Akula fires SS-N-16 or Klub , its actually a rocket propelled torpedo, once torpedo hits the water she will go in an active search at the target. Now since Sea Wolf is a moving target the submarine may not be there where the torpedo may be searching for , if she is there and if an active sonar search is initiated , Sea Wolf will immediately employ decoys and began evasive manouveres , its not hard to defeat a Torpedo that is independent and not guided by wire and relies on active sonar. Active sonar performance against Rubber Tiles are reduced as well , So there is no gurantee that the Klub or SS-N-16 will hit the Submarine at those long distance and even weapons have their own probability of kill. Those weapons like SS-N-16 and Klub or SS-N-15 are effective against surface ships which will find it hard to evade the active autonomous torpedoes. The most effective weapons against Submarine are Wire Guided Torpedoes like UGST-M ,Mk-48 ADCAP,Black Shark etc that are wire guided and are autonomous in the last few km and can take care of moving targets like Submarine are different depth. The ability to maintain control till the last moment for these torpedoes from submarine wire guidance means they are less vulnerable to enemy submarine decoys , countermeasures ,speed , manouveribility etc . Shkval is just a suicide weapon deployed at last moment , either to break enemy submarine/Torpedo lock or to unnerve them with a high speed non-guided weapon approaching them , giving Akula few seconds to escape. Western submarine scores on acoustic which is better silencing , better long range torpedoes , much capable passive sonar due to advantage in signal processing and they too have decoys. Infact Russian Torpedo development has remained by and large static in 2 decades and its only with Fizik 2 they are moving to new torpedo. Here is Akula recently being used to trails UK SSBN on Deterrent Patrol but it seems UK got wind of it and took adequate measures. Of course i realize that any submarine is a moving target and highly time-sensitive target and is just this one of the reasons for the enormous advantages offered by a weapon like an RPK-7 "Ветер" . Maybe adding some numbers will render the previous example even more clear also on this point . Let put that the momentary tracking of the enemy submarine ,(through group of sonobuoys, MAD sensors ,sea-floor thermo-differential detectors ,space based IR/wake pattern processing assets etc...etc..)previously described in mine example would last 7 minutes ,ok ? Now , take into examination the most distant Russian submarine in my example : the Improved Akula at 85 km far from the SS-N21 ,ok ? This Improved Akula manage to shot its salvo of three or four RPK-7 ,let put, 1:30 minutes (in reality the operation would require no more than 40-50 seconds but i want to “stretch” the figures at maximum adding some handicaps resulting from unexpected difficulties, validation problems or crew inefficiencies to render all even more persuading ) ,. The rocket propulsion start and the missile go on at ,let put, Mach 1 (also here , RPK-7 is ,obviously, significantly faster than that , but i want to take a lower figure for the reason previously explained) . This salvo of RPK-7 will employ, at this speed , 250 seconds ,or 4 minutes and 10 seconds to reach the position of Sea Wolf , therefore 5 minutes and 40 seconds in total from the first contact to the delivery of the three /four UMGT-1 torpedo on the enemy submarine exact position. Practically in spite we have taken into examination a very brief tracking time window for the Sea Wolf and in spite we have put a lot of handicaps and retards over the enemy engaging platforms and its weapons this SSN-21 has not even only one chance to exit from this small enemy ASW detector’s area before having four UMGT-1 engaging it . -At that we can add that ,to the contrary of a torpedo this SSN-21 will become eventually aware to be under attack only the instant that the first UMGT-1 touch the water surface just over it and that ,at cause of the much lower reserve buoyancy , significantly lower hull’s material strength and lack of a double hull its chances to survive are incomparably lower than a Russian submarine in its same class . Now take into examination the opposite situation ,but don’t consider the Sea Wolf at 85 Km of distance from the sensor area where the Improved Akula of the example has been detected but the Improved Los Angeles class at only 38 Km. Now image that this Improved Los Angeles class would be capable to deliver the latest version of its MK-48 ADCAP……instantaneously , literally at zero seconds from the contact , this MK-48 ADCAP in 7 minutes cover at its maximum speed (not its average) 11,8 km ,practically not even one third of the required range before the contact with the Improved Akula will be definitely lost. Practically in spite,in this scenario , we have taken into examination an US submarine at only 38 km of distance (instead of the 85km in the example with the Russian submarine ) and have conceded to it totally irrational “bonus” , don’t exist even only one chance that the Improved Akula could be engaged before the contact with it will be lost ..and without put in the equation the possibility for the Akula to eventually employ its MG-74s to even “use” a similar sensor area at its own advantage . Like you can see the fact that submarines are time-sensitive targets (and even more with submarines with significantly higher speed and depth limits) put a very big premium on the type of technologies and design solutions implemented in Soviet/Russian submarines. Now i must go, but if i will get a bit of time, will continue at return from work. Mindstorm wrote: Maybe adding some numbers will render the previous example even more clear also on this point . My Dear Friend Mindstorm , I hope you understand all those 80-40-50 km figure you have pulled out from god knows where does not work in real world using Passive Sonars and against very silent submarine like Sea Wolf ..... you are simply assuming MAD , Sonobouys , ASW aircraft , satellites etc will be all available to Russian submarine. In real world a Sea Wolf or Akula will be operating alone or at best in pair with other Akula to hunt NATO or US submarine , Please remember US Navy 4th Gen Submarine like Sea Wolf or Virginia are highly Net Centric with C4I3 systems and have a far far superior capability to communicate with other assets of USN like Satellite , Surface Ship and Submarine then any Russian Submarine will have now or will have it in a decade. So in real world in absent of any asset to assist Sub Hunting to either side , both submarine will be using Passive Sonar and in case of Akula Passive Sonar and at best SOKS to detect each other. I would still bet USN any day will have better ability to assist its Submarine on hunting role then Russian Navy could do it today. In a scenario where both submarine uses passive means of detection in favourible condition lets assume its favourable a Akula-2 will detect Sea Wolf in under single digit Km say 9-10 km while in the same condition a Sea Wolf powerful Passive Sonar will be able to detect the less acoustic capable Akula-2 much further and earlier. Chances are a Sea Wolf will be putting in a ADCAP torpedo earlier in water against a Akula then a Akula will be able to put a UGST against Sea Wolf. Please remember Sea Wolf is acoustically far quiter then Akula-2 and has much better and capable Spherical Sonar , such sonar is only coming with yasen in Russian Navy. Bottom line is in a favourable scenerio a Sea Wolf will be able to beat a Akula more number of times then vice verse. In a unfavourable an Akula and Sea Wolf will detect each other on single digit Km and here to Sea Wolf more capable passive sonar holds the edge. 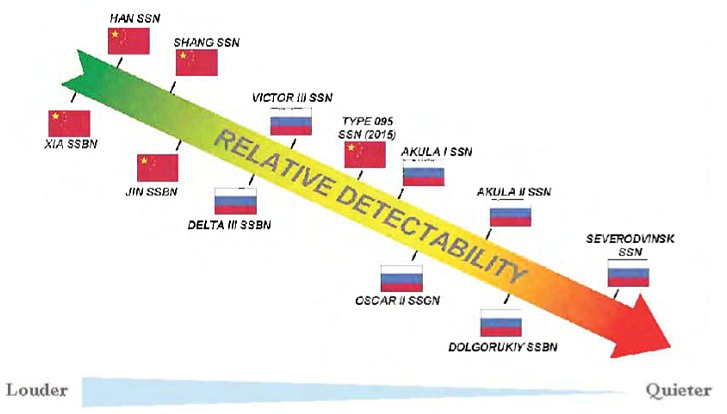 Now the only grey area is SOKS , no one knows how SOKS works in real world and how capable it is , if its a revolutionary detection system then may be and i say may be Akula can detect Sea Wolf earlier and then she can use her torpedoes much earlier. But in all scenario the SS-N-16 will never be used , SS-N-16 is useful against Noisy Submarine of earlier generation or against Surface Ships that generates noise which can be heard many many Km away by modern Passive Sonar and then you can use the standoff advantage of such weapon to good effect. You can easily bet a Akula commander will use his best wire guided torpedo as it provides best ability to evade modern decoys and can keep track of moving target or target that knows its under attack and can do evasive manouver to defeat the torpedoes , using combination of depth , speed ,hard manouvering and decoys. Ofcourse lets say by stretch of imagination using Voodoo magic a Akula does detect a Sea Wolf at 80-100 km then the best use of SS-N-16 is to use it if it has tactical nukes. In this way a Sea Wolf wont be able to evade it and the submarine can just fire two SS-N-16 with say 10Kt Nukes at sea wolf and then get out as fast as possible it can. US too has similar rocked propelled torpedo like ASROC but decided against using in submarine or developed similar weapon becuse of its limited potential against a submarine , both in long range positive detection of targets and the ability to the torpedo to reach and search and find a submarine , find it and then go active autonomously at the target. its near impossible to that with submarine. Hence NATO/US thrust has been to keep developing long range torpedoes and more advanced variant of it with Variable Speed propulsion , Advanced Navigation and Guidance , Dual Mode Active/Passive Guidance , Intelligent Algorithim to evade decoys and Autonomous capabililty during the last few Km at the target.